Fountas and Pinnell Type Comprehension Questions Fiction and Non fiction Bundle. 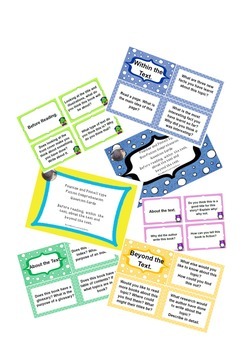 These cards are designed to build your students comprehension skills. These questions are based on the Fountas and Pinnell reading system. There are two sets one for fiction and one for non fiction texts. There are four sets of cards in each set for before reading, with in the text, about the text and beyond the text. In my classroom I print and laminate the cards and keep them in sets. I use them as focus and question prompts when reading the big book, when writing specific comprehension questions for students guided reading books and as an independent activity. As an independent activity students are required to answer questions form all sections. I hope your students enjoy working with them.